Adopt-A-Pet.com News < Adopt-a-Pet.com receives awards! We were very honored to be the recipient of not just one, but two awards at The Stray Cat Club charity gala in Beverly Hills this weekend! While we believe the staff, volunteers, and donors who make animal rescue possible are heroes that deserve awards every day, we were filled with gratitude when an organization that works so hard through their extraordinary contributions to end the feral cat crisis in Los Angeles county chose Adopt-a-Pet.com to accept these awards. The first award was from The Stray Cat Alliance themselves, a beautiful engraved plaque that you see at right. 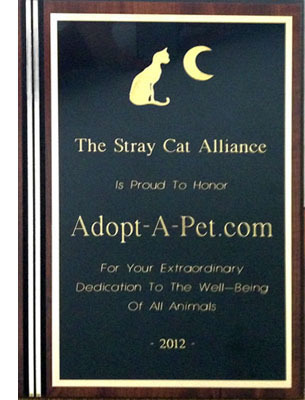 It says “The Stray Cat Alliance Is Proud To Honor Adopt-A-Pet.com For Your Extraordinary Dedication To The Well-Being Of All Animals.” How cool is that? Christi Metropol the founder of The Stray Cat Alliance presented the award on stage to me which I accepted on behalf of all of us at Adopt-a-Pet.com, in front of hundreds of animal welfare supporters. The second award was a surprise! I’d already stepped down off the stage (and my pounding heart was just returning to normal) when I heard our name called again! 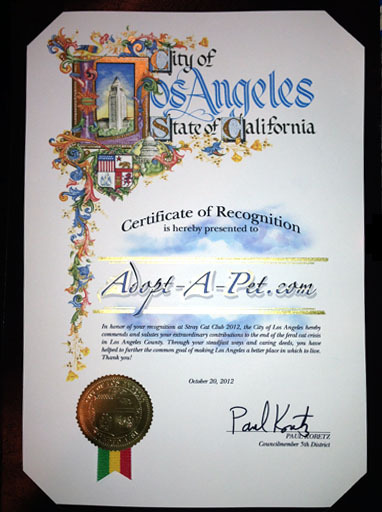 This time it was by Councilmember Paul Koretz, who presented Adopt-a-Pet.com with a Certificate of Recognition from the City of Los Angeles and the State of California. What a proud moment! The gala was a fundraising event for The Stray Cat Alliance, with what must have been over 200 silent auction prizes that people could bid for online as well as at the event. They did a live auction too, and a call out for donations, which raised over $30,000 in a few minutes! All these funds will go into the spay and neuter programs The Stray Cat Alliance runs in targeted areas of Los Angeles, providing free surgeries and medical care for any cat, stray, feral, or owned. Los Angeles has a huge cat care crisis and is very fortunate to have organizations like The Stray Cat Alliance working so hard to provide the care Los Angeles’s cats need. Adding some lighthearted fun to the event was that it was costumes optional! 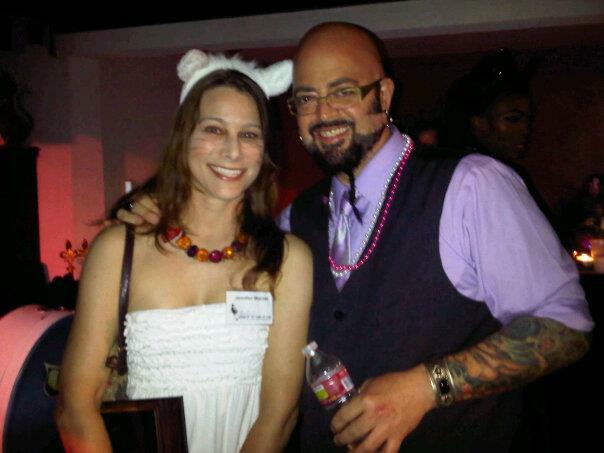 Of course I went as a cat, and who did I get to meet but the Cat Daddy himself, Jackson Galaxy. (Photo below.) Fortunately, I was well behaved so they didn’t need to call on his cat whispering super powers, but it was great to see him and so many other cat welfare advocates out supporting such a great cause.